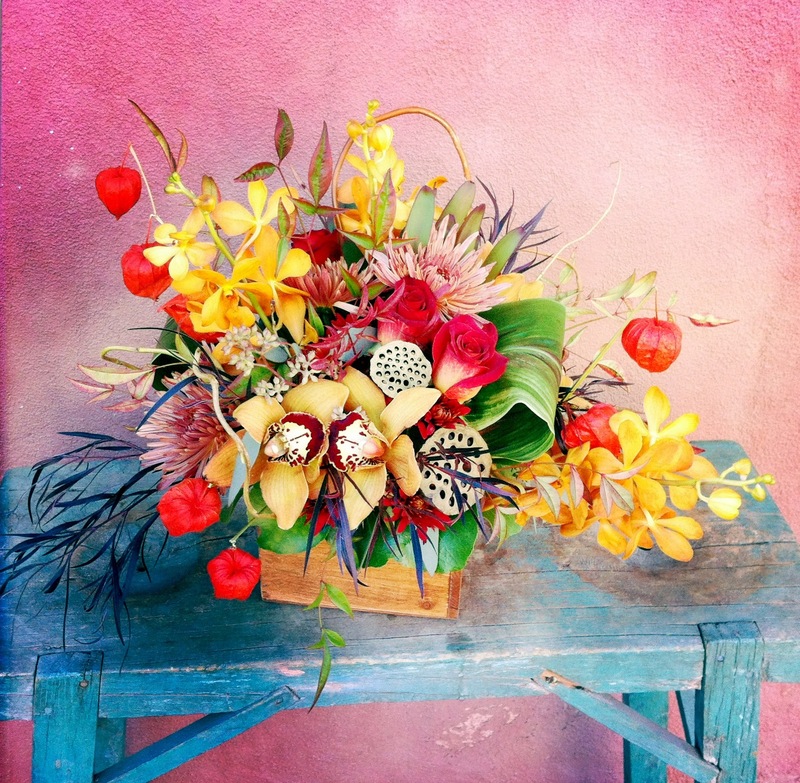 Here are a few snaps of a floral centerpiece I put together for Thanksgiving. Floral design has always been so special to me as it was what brought me into the world of weddings. I love how the process of floral arranging is a dialog between the flower and the designer, each dictating the next move to one another. It is almost like a zen practice to me, calming me as I cut each stem and contemplate the perfect position to place it. It is in moments like these that I let my mind wander over all of the blessing in my life; to think how grateful I am to be where I am and doing what I’m doing. Gratitude is a practice I strive for every day, but on days like today, I realize there are too many blessings to count and so much to be thankful for. God has blessed me so. First, you’ll need are some large, WIDE, bowls. Really, any vessel will do as long as the open surface area is big! For 80 cards I used 2) 24″ diameter bowls and 1) oblong 18″x 10 bowl. So fill these puppies up with sand and smooth out about 1 inch from the top edge of the bowl. Then spread a thin layer of pretty polished gravel on top (available at craft stores). Now time for the cards. We calligraphied a piece of card stock that was 2″x 4″ on a vertical orientation. That way, when we stuck it into the sand, there wasn’t any writing covered. 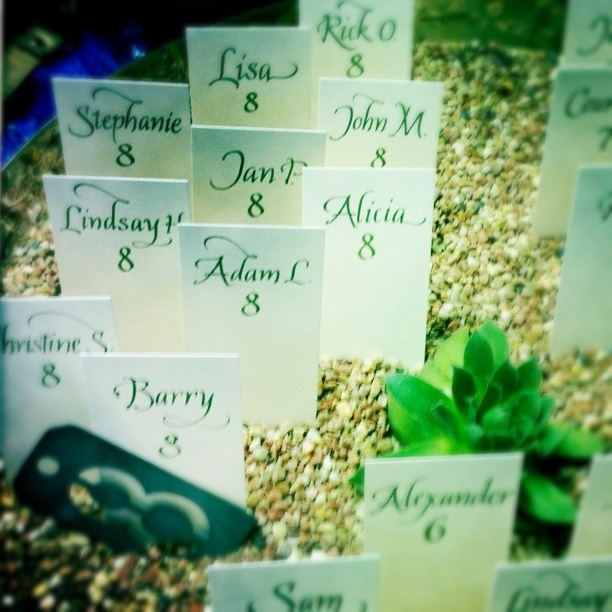 Placement is the trickiest part because you want the card to be stuck into the sand at the perfect angle so people can read it as they are going to the reception. Be sure look at it from their point of view to make sure it’s legible. Luckily, it’s really easy to start over if you mess up. Now, the fun part. 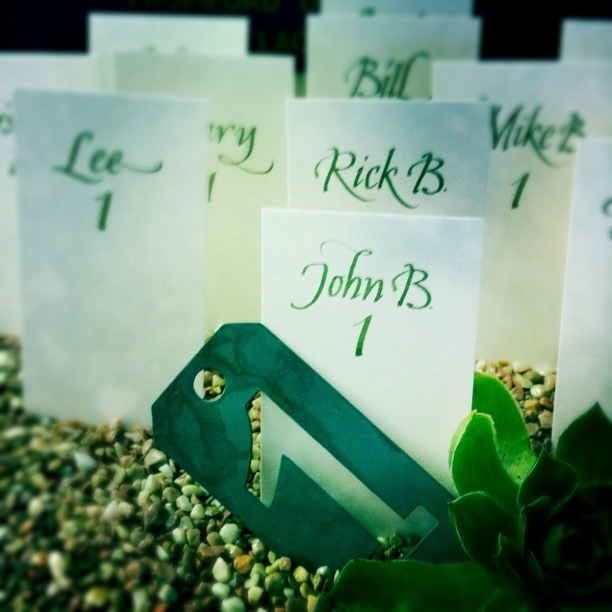 Marja had these awesome zinc number stencils to designate the table number. Set them artfully in front of your card grouping. If you have more room, you can also use these 3-dimensional numbers. Then we placed a few gorgeous succulents to really hint at a desert landscape and bring a little greenery to the mix. Here is a quick snap from the ceremony where we featured these lovely place card bowls. A late-summer storm tiptoed along the horizon and created quite the backdrop for the vows…it literally started to downpour the minute they kissed and the service ended! Talk about a grand exit! 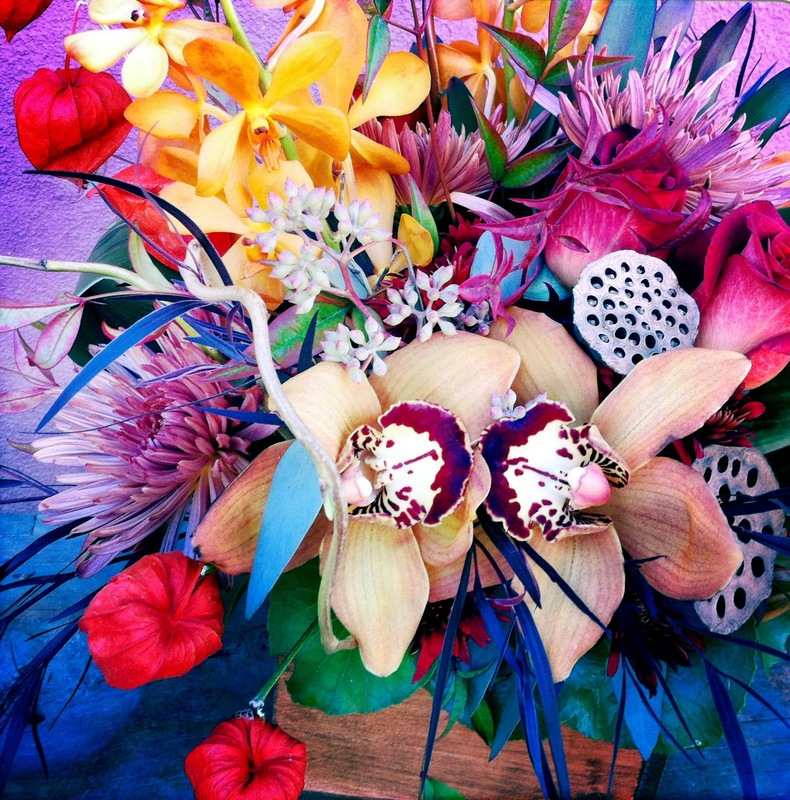 A few more images from the reception…absolutely gorgeous florals designed by Andrea Soorikian. I write this post with 7 days until my last wedding of the 2011 season, also my LARGEST wedding of the season. I can’t tell you how thrilled I am about it. With so much planning and prep, it’s sure to be ah-mazing! Talk about going out with a bang! Now, as I am sitting at my computer, sifting through my in-box, I am corresponding with brides for my 2012 season. Everything is new and energizing to them and even though I am completely beat from the 2011 season, I am ignited with their sparks of excitement, the thrill to create something new, just for them! 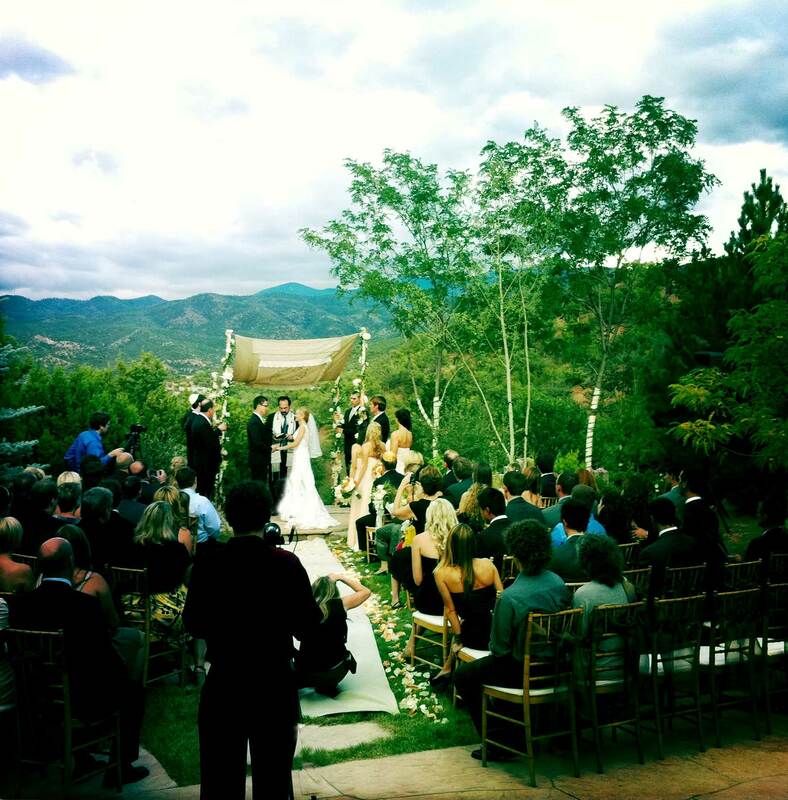 I am always stunned at how weddings never get old to me; the more I look at them, the more a-flutter I get. Even in the thick of a stressful installation, or crunching a budget that just doesn’t want to be crunched, or tying the 100th bow on a favor, I am still in love with the thrill of creating, designing, and interacting. Each weekend I take my post behind the scenes as part of a different story, operating as the (wo)man behind the curtain. I make sure everything is running smoothly, that all my “i”s are dotted and my “t”s crossed. I make sure everyone is having a great time; that everything feels right. I realize this is what makes me tick, it makes me want to sing and dance and laugh. Usually after events my feet are aching and blistered, but usually it’s my cheeks that hurt more, from smiling so much and being part of such a blissful occasion. I am truly blessed to love the work I do. Rad. A note about the animation above: Every wedding I am lucky enough to work with incredibly talented vendors. Here I am dancing in the glow of a beautiful ceremony altar space I designed while being serenaded by an amazing guitarist, Yves Lucero. These slow-exposure pics were snapped by the ever talented Ginger Russell. Is it obvious I am such a ham? P.S. Yves sent me this…and I now understand why wedding planning is as good as getting 8 hugs a day!